Hey, y’all! I just returned from Austin Thursday night. My luggage arrived Friday morning. I survived a near-evacuation of the airport (false alarm), a missed flight and a frontal pat-down by TSA for wearing a beaded top. It’s been an eventful week, with my birthday and wedding anniversary thrown in. I’m now closer to 50 than 40 and have been married for 22 years. So, no recipe today, but I do have a few Austin recommendations. Plus, I have to share what my newfound Aussie friends taught me. All this, accompanied by a blurry photo taken with my iPhone. 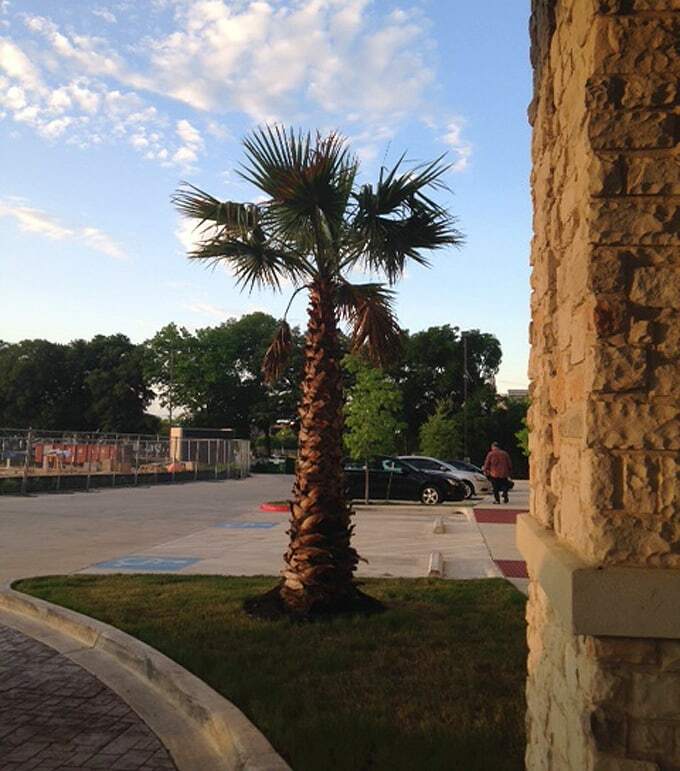 But look, a palm tree! I traveled to Austin for a work-related conference, so I knew I wouldn’t have much time to explore. But there were three things on my must-do list: Tex-Mex, Downtown and barbeque. I managed all three, pulling off the latter at the airport, of all places. First, the food, of course. By far, my best meal was at Manuel’s, where I was swooning over the Gulf shrimp Flautas, which are grilled enchiladas served with guacamole, salsa verde, sour cream and rice. A couple of my companions really enjoyed their Chile Relleno Del Mar, which is a roasted poblano pepper stuffed with bay scallops, shrimp and fresh blue lump crab in a chile de arbol crema, topped with broiled queso Gouda. Yum! I’d go back in a heartbeat, and it looks like there are a few locations, including Downtown. And now for Downtown. My Aussie friends took me bar-hopping, which I haven’t done in decades, and trust me, I could only handle a few sips at each place. We checked out the dueling piano bar on Sixth Street, which was fun, the rooftop Speakeasy, which requires climbing what appears to be a stairway to heaven, and a couple more places. By far, the highlight for me was listening to Tish & The Mizzbehavin Band perform a mix of blues and soul at The Dizzy Rooster. Tish Eubanks has an unforgettable voice and a larger-than-life personality. I may or may not have danced so much that she called me up to the mic with her to get my “woo-woo on.” What happens in Austin…may end up on the Internet. Have you heard of mateship? It’s part of Australian culture, and I think it’s worth spreading. My friend Paul explained that it’s about loyalty and looking out for one another. Whether you’ve been friends or enemies along the way, you take care of your mates. I’m fortunate to have experienced mateship with my Aussie friends, and I can’t help but think about how this principle applies to my husband, kids, family, friends, colleagues and all of you who read Cooking with Mamma C. It makes my heart swell. Wow, that’s a lot of milestones in one week! Our wedding was postponed from October, and we just grabbed the first Sunday after Lent, lol. It does make for a special time of year though. Such a fun trip…my kids are always saying they want to go to Austin – now I see why! And I’ve never heard the term mateship but it certainly resonates. I love that. Thanks for sharing, my friend! Oh my heavens I must say you had a week alright! Happy Birthday and Happy Anniversary! How coincidental that today is my husband birthday (they’re golfing right now) then the big birthday bash! Then we have an anniversary coming up too! We have out of State company all week visiting (he is a college friend of my husband) and his family. So lots going on here! Grilling out and swimming and later the birthday bash. Life is good! Your Florida Bud, Cheryl. Thanks, Cheryl! Happy Birthday to your husband, who must be a fellow adventurous Aries. Enjoy the festivities!